The Wagner transfemoral osteotomy – in which the anterior one-third of the femur is osteotomized – is just 1 type of osteotomy that surgeons have in their toolbox for revision total hip arthroplasty, Michael. J. Taunton, MD, said at the start of his presentation at ICJR’s 6th Annual Revision Hip & Knee Course. Which osteotomy they use for extensile exposure will depend on the situation. For example, Dr. Taunton, from Mayo Clinic in Rochester, Minnesota, showed cases examples of patients with extensive proximal osteolysis and noted that the Wagner transfemoral osteotomy was more appropriate for these patients than an extended trochanteric osteotomy (ETO). If he had performed an ETO, he said, the bones may have crumbled. The Wagner transfemoral osteotomy is a versatile osteotomy, Dr. Taunton said, but surgeons who utilize it must decide they’re going to do the Wagner osteotomy as they’re making their approach, unlike an ETO. Performing an anterolateral approach and then the Wagner osteotomy would have the undesirable consequence of devitalizing the anterior bone, he said. 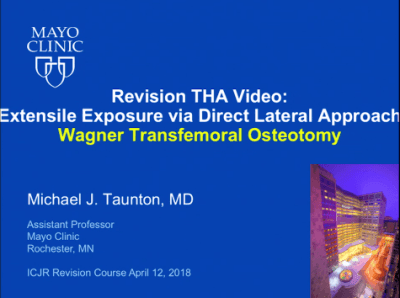 Click the image above to watch Dr. Taunton’s presentation, in which he discusses and demonstrates his technique for a Wagner transfemoral osteotomy. Dr. Taunton has disclosed that he is a consultant for and has a product development agreement with DJO Global.